Submitting articles directly from the WordPress interface is simple for our 10,000+ members now using the WordPress plugin. 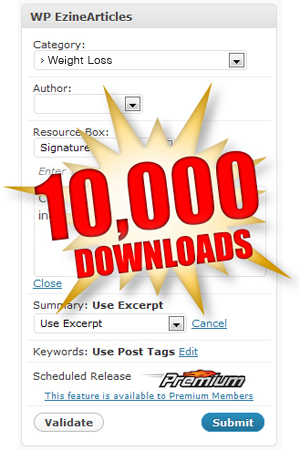 Earlier this week, we found out that the 10,000-download milestone for our WordPress plugin was within reach. That milestone was officially met late yesterday. We’re really excited for all the Expert Authors who have taken advantage of this feature. A big thanks goes out to the 10,000 members who made this possible. More authors than ever are using the WordPress plugin to easily repurpose new and existing blog posts right from their WordPress user interface. If you’re a WordPress user and you want to expand the reach of your posts, here’s a refresher on how to download the WordPress plugin and make submitting to EzineArticles easier than ever. Then, follow the instructions on the next page to complete the installation. For additional help through the process, watch this video or contact our Member Support Team through your account. Once the plugin is installed, you’re ready to start submitting directly from the WordPress user interface. If you’re a WordPress user, take a few moments to install this plugin and help us on our way to the 20,000 mark. The savings in time and effort will make you very glad that you did! Then, of course, submit some of your existing and/or new posts as articles today. Then stop back here and leave a comment to let us know what you think. ok, i will have a try, as my wordpress account have been 2 years, so i believe, though installing the plugins, there will be more functions to use. I thought we were only supposed to submit 100% unique articles that didn’t appear anywhere else on the web to EzineArticles? All this time I’ve been writing unique articles when I didn’t need too?? I apologize for the delay in my response. Your content must be unique to you which means 100% exclusively owned by you. This doesn’t mean you cannot repurpose that content and use it elsewhere. As long as you own it, use it were you would like. My only suggestion to this is to put your name on it, wherever you post it. My understanding is that Google does not look favorable on websites if the same content was submitted in different places. Please give me you understanding. Since many of the WordPress bloggers are so prolific, I’d expect some major increases in the quantities of some of the authors here using this system. Thus, we should see many new names moving up on the quantity page. And although it may take some authors a few extra-minutes tweaking some of these posts and perhaps adding a paragraph or two to make word count in some cases, I see this as a major plus, and also a benefit, just in case their blogs go down in the future. There is safety in spreading your information in this way. It’s very very wise, just as anyone who has had their blog go down. Wow, EzineArticles rocks, this is awesome indeed. I would like to know too… if including the so many not always unique blog posts helps or hurts SEO rankings. I think Google sees EzineArticle as a source of unique content. Are you sure Google and others will still see EzineArticles as unique content with all the not so unique blog post ? Nice plugin. Easy to install and use, except of course all the changes you have to make to your blog posts in order to meet the EzineArticles criteria. Still saves a few moments. Problem with categories – “Business >> Top 10 or Top 7” lists does not seem to be recognised. The problem with the categories has been resolved. Each individual website is unique in its own right. If you look at the content on your blog (aside from your article) and then look at the content on EzineArticles where your duplicate article shows there are several differences. Different ads, different headings and footer, different internal and external links and so on. Changing the heading of the article might be beneficial, especially if its the heading shown in the Title (Status bar). But to search engines the rest of the page is likely to be unique due to the changes in other content.